Anime-Planet's Fall 2018 Anime Challenge is now available to join! Discussion in 'Site Announcements' started by sothis, Sep 22, 2018. Planning to watch anything this Fall 2018 season? Join the Fall 2018 Anime Challenge! Watch any of the 90+ anime available that start in Fall 2018 as part of the challenge. 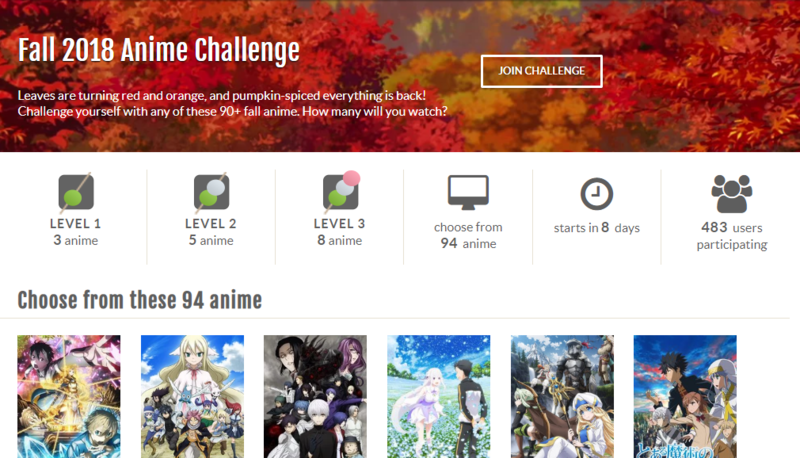 Anime that started in previous seasons won't count - you can check the challenge page at any time to see which ones do count. Read more about the challenge feature/FAQ here. Kari5, AmeagariHime, Nicknames and 2 others like this.